When it comes to file sharing from Windows computer, people often think of Homegroup for computer network sharing or USB connection for mobile phone transfer. As a matter of fact, file sharing methods on Windows 10 are multiple and some are very convenient and quick. They are very helpful when traditional methods don’t work, for example, Android USB is not recognized on Windows 10. In this article, you’ll learn how to share Windows 10 files with built-in feature or using social apps, like Facebook Messenger and WhatsApp Desktop. Microsoft has been optimizing file sharing feature since Windows 7 or earlier. 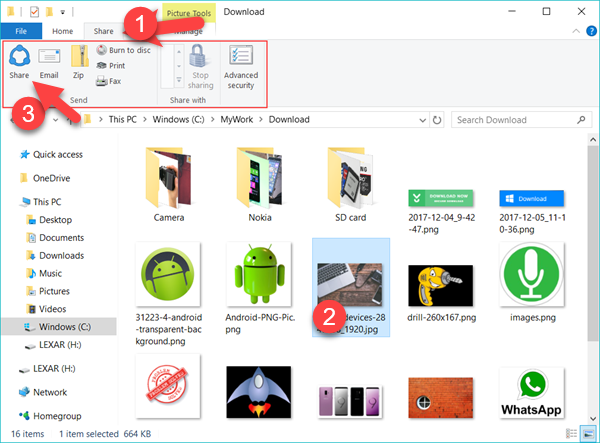 In Windows 10, the system is built in with a quick sharing function in File Explorer, which is very similar to how Android users do it on mobile phone file manager. Here is how to do it. Step 1. Navigate to the file you want to share in Windows 10 File Explorer. Step 2. Click the Share tab at the top of the window. Step 3. Select the file(s) you want to share and click Share button. Step 4. Choose the app you want to share with. The system will initiate the selected app. Note: Depending on the file type you select to share, the available apps for sharing may vary. Step 5. Share the file(s) to a contact or group with the app. By default, there are only several options, including Mail and OneNote (which are already built in). In order to share files with more apps, like Skype and Facebook, you need to install the corresponding desktop version apps from Microsoft Store on your Windows 10 first. 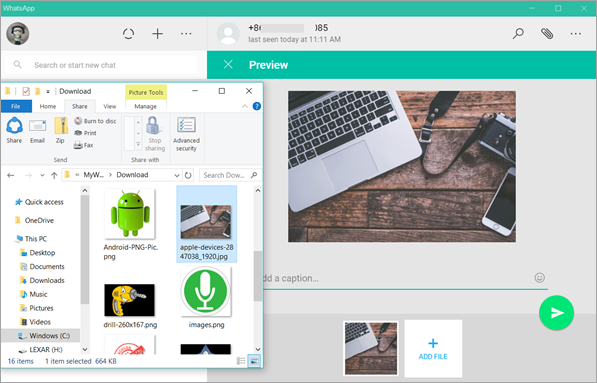 Actually, for social apps, like WhatsApp Desktop, it is easier to share files via the app by drag and drop as long as it is installed. Anyway, it is still very useful to share files in File Explorer via apps like Email and OneNote which are irreplaceable in workplace. As the most popular platform, mobile phone also affects how people want to share files on computer. Many people want to share photos to their Facebook or WhatsApp contacts or as status, but the image files are currently in a Windows 10 computer, so they have to connect phone to PC to do the transfer first. 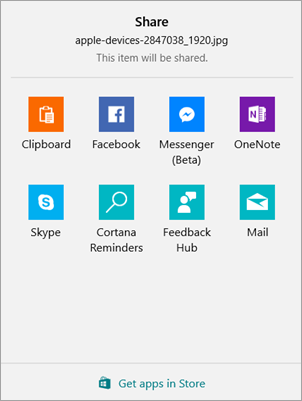 Actually, we can share files via social apps in Windows 10 directly. The operation is extremely easy: just launch the app, then drag and drop the file to the app to share. Nevertheless, the file types that the social apps support are different. Tip: WhatsApp Desktop only works when your mobile WhatsApp is able to access internet. It also has 100MB limit for file sharing each time. This is also an excellent choice if you want to transfer files from Windows 10 to your own phone. For example, on WhatsApp for mobile, add a new contact with your phone number, and then drag and drop files on WhatsApp Desktop and send to yourself. Windows 10 still offers option to share files and folders via Homegroup. Though it is not as easy as the methods above, Homegroup is quite convenient for big business once it is properly set up. Just choose the method(s) that best fits your needs for sharing Windows 10 files. In case you need to restore deleted files, which are not in the Recycle bin of your Windows 10 computer, try Jihosoft File Recovery.